Oliver Jungel’s pared-back interior design in Düsseldorf’s Park Terraces is sleekly confident: Perfectly matched lamps and a statement mirror accentuate the foyer. At Haus Hardenberg, in the Zoo quarter of Düsseldorf, recessed mirrors and polished natural stone floors sport a high-beam gleam. Some simply call it a hallway, a foyer or even an entrance room, but these straightforward terms shouldn’t obscure the fact that you never get a second chance to make a first impression! And how better could an interior designer make a first impression than with an inviting foyer? Whether you’re entering a room with towering ceilings, elegant lighting and glowing natural stone floors or coming into a cozy foyer with warm wood elements and a gorgeous bouquet of flowers on a console table, the entryway of a home sets the tone for the rest of its style. Briefly, yes, because usually one moves quickly into the rest of the home, but still perfectly, to highlight the luxurious character of a high-quality property. Shimmering steel and dark grandezza marble: Nameplates and mailboxes are made to order by hand, like little works of art, for each property in Berlin (left) and Düsseldorf. Completely classic! Despite a wide array of stylistic directions, the firm’s entryways always feature the indisputable hallmark of Schmitzian design: premium materials transformed by high-quality craftsmanship. To make the arrival into a RALF SCHMITZ property as perfect as possible, every detail is considered, even before crossing over the threshold. Tastefully designed and handcrafted nameplates and mailboxes give a small taste of the extraordinary interior design that awaits within. 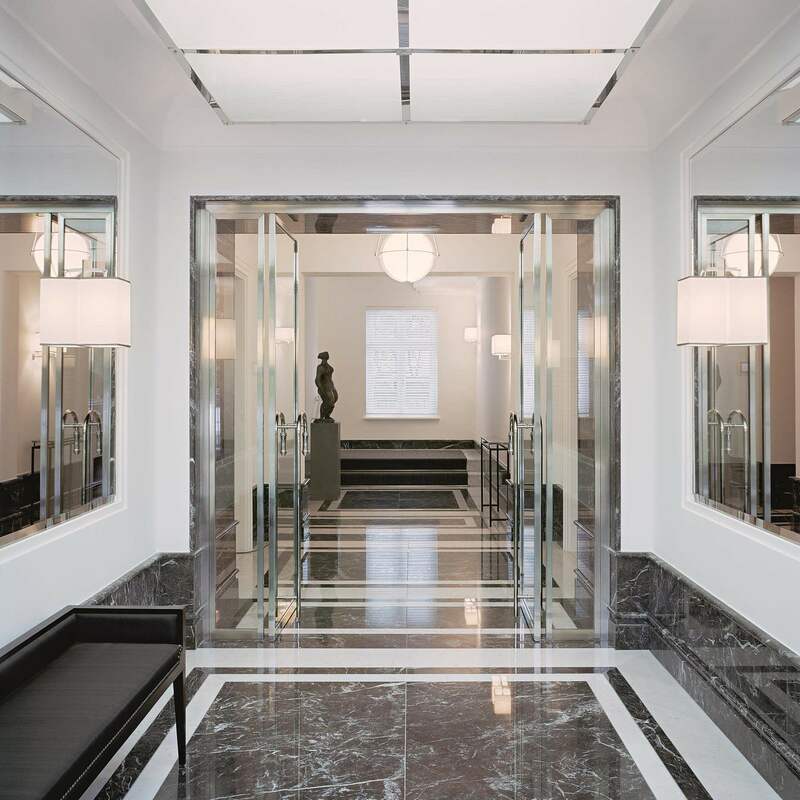 Exquisite furniture, a splendid mirror, a powerful piece of art and an impressive marble floor all play a role in a stately foyer to deliver the message that the property is a paragon of good taste. Enter!